Thomas Cole’s Journey is curated by Elizabeth Kornhauser, Alice Pratt Brown Curator of American Paintings and Sculpture, Metropolitan Museum of Art, Tim Barringer, Paul Mellon Professor in the History of Art, Yale University, and Christopher Riopelle, Curator of Post 1800 Paintings, National Gallery, London. The Metropolitan Museum of Art is located at 1000 Fifth Avenue, New York. For more information, call (518) 943–7465 or email info@thomascole.org. The Thomas Cole National Historic Site preserves and interprets the home and studios of Thomas Cole, the founder of the Hudson River School of painting, the nation’s first art movement. 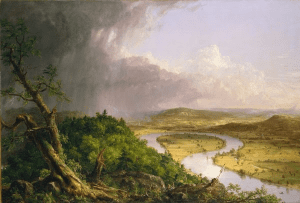 Painting: View from Mount Holyoke, Northampton, Massachusetts, after a Thunderstorm — The Oxbow, 1836, by Thomas Cole.